4Dcell micropatterned multi-well plates hold a perfectly organized culture substrate aiming for cell normalization. Evenly distributed on adhesive patterns, cells have a controlled geometry allowing a standardization of the assays. The 4Dcell micropatterning technology enables a 2D cell geometry control. A set of patterns is arranged on a glass bottom to receive cells. Using an anti adhesive agent and some ECM proteins such as fibronectin or collagen, cells can adhere to the shape imposed by the micropattern. Cells are going to embrace the geometry of this new environment. Dussaud S., Jouve C., Hulot J.S., 2018, INSERM, PARCC. The FMP micropatterningTM is a 96-well plate holding a micropatterned surface to control the 2D geometry of cells and standardize cellular assays. 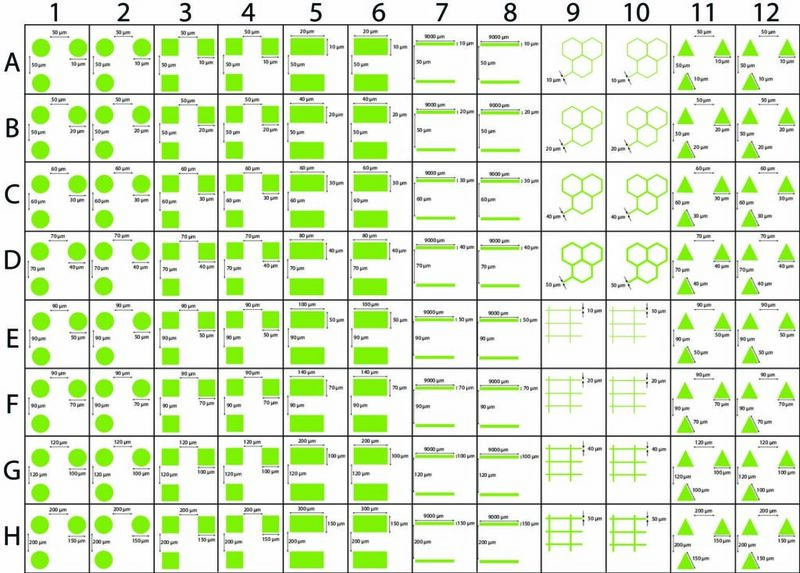 Each 96-well plate has the 6 standard shapes of 4Dcell: dots, squares, rectangles, triangles, lines and grids, as well as sizes going from 10 to 150 µm. We also offer the choice of a customizable solution. The FMP micropatterningTM is compatible with industrial standards for screening platforms. 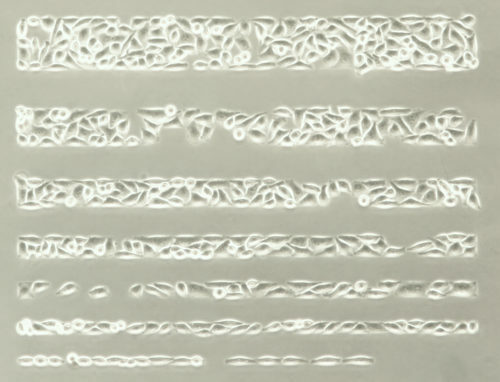 The bottom of the FMP plate is made in glass and is coated with an anti-adhesive polymer to delimitate the borders of the patterns. This coating is resistant to oxidation which makes it stable enough to plate cells on patterns for several days. Video of cells developing on the long term cell culture polymer micropatterns. hPSC-CM on line micropatterns of 10 to 70 µm width imaged by fluorescence microscopy. Dussaud S., Jouve C., Hulot J.S., 2018. 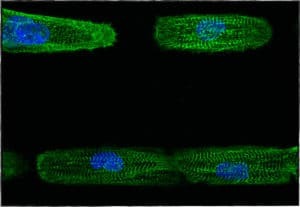 Image of micropatterned HeLa cells in lines of 100 to 10 µm width, 4Dcell lab (2018). 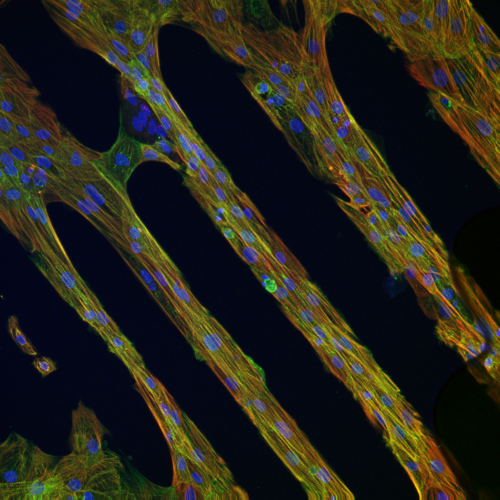 Image of micropatterned cells in lines (labelled by fluorescence) obtained with a 4Dcell photomask. Hôpital Saint Louis, experiment run with Dr. Benoit Vianay.